Kerala, God’s Own Country is famous for its multifarious culture and the festivals which are well-stocked with colors and sound. The festivals celebrated in Kerala are associated with the cultures and the traditions of the state. Most of the festivals in Kerala are associated with temple rituals. As you can see in this video, the festivals are colorful and have their own importance in the history of the state. During the annual festivals in the temples of Kerala, you can see caparisoned elephants carrying the deity which is a beautiful view. Traditional art forms with colorful processions and the rhythmic blend of percussion instruments add more charm to these festivals. 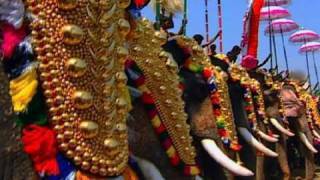 Tourists from various parts of the world come to witness these prestigious festivals of Kerala.